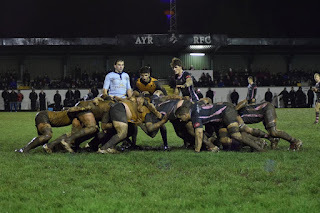 Ayr welcome Currie Chieftains to Millbrae on Saturday for round thirteen of the BT Premiership, kicking off at 3pm. After the tense (and muddy) nature of the last meeting between the two teams in round one of the BT Cup in November, both will be prepared for another game that could very well go down to the wire. 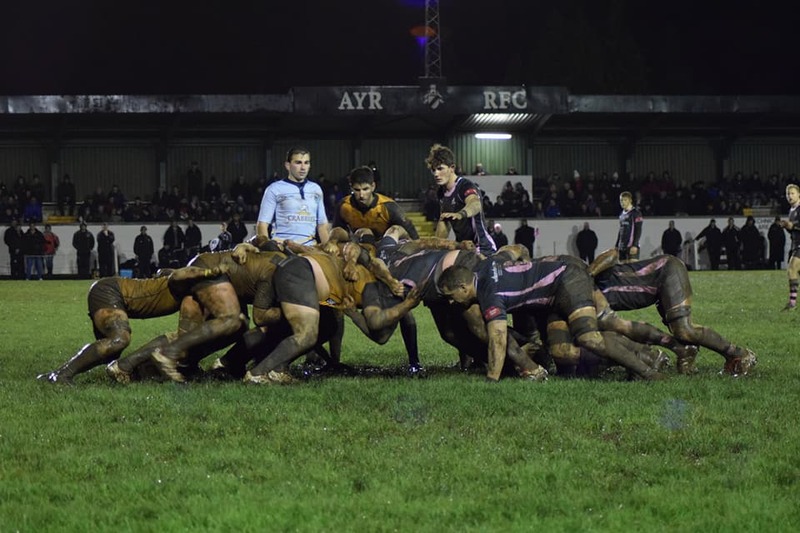 "We expect an equally close encounter this weekend," says Ayr RFC head coach Calum Forrester. "Given how tight the fight is for a top four spot (in the BT Premiership table), both teams will be aware of how important it is to get a win to take into the new year." The only change to the squad is the inclusion on the bench of Ryan Grant, who has been released by Glasgow Warriors for the weekend. 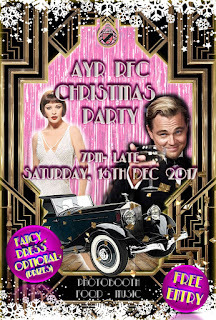 It's the last match of the calendar year, so there will be a good atmosphere at Millbrae, which will no doubt be carried on into the clubhouse for the Christmas party, to which everyone is invited to celebrate a terrific 2017. Grant Anderson, 14. Sam Graham, 13. Paddy Dewhirst, 12. Stafford McDowall, 11. Craig Gossman; 10. Scott Lyle, 9. Lewis Young; 1. Robin Hislop, 2. Robbie Smith, 3. Steven Longwell; 4. Blair Macpherson, 5. Robert McAlpine; 6. Tommy Spinks, 7. George Stokes, 8. Pete McCallum (c). Lewis Anderson, 17. Ryan Grant, 18. Scott Sutherland, 19. Jonathan Agnew, 20. Jamie Bova. Ayr 2nd XV kick-off at 2pm against Currie Chieftains A in BT National Reserve 1. 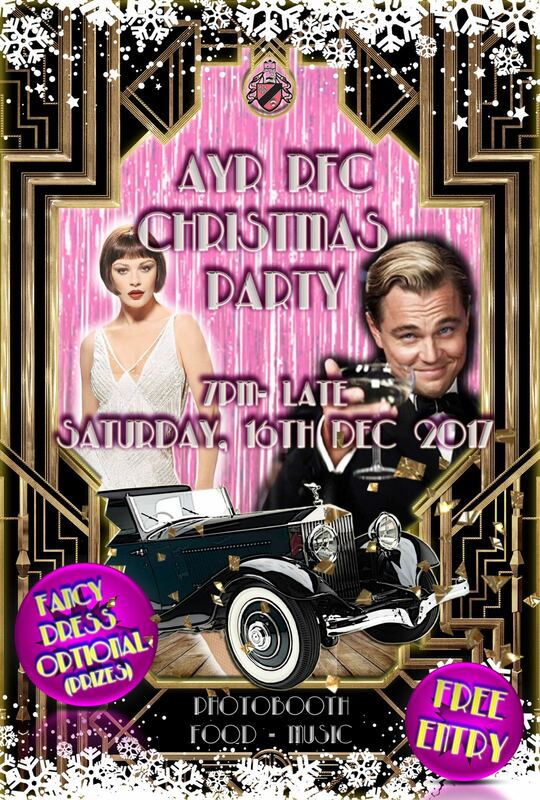 Once again, coaches Gordon Kotze and Jim McKay have put together a strong squad of youth and experience, with the dynamic front row of Ben Paterson, Stuart Collier and Ruairidh Sayce, as well as creative half-backs Harry Warr and Johnny McCorkindale, well able to ensure an entertaining game to finish 2017. Sam Gray, 14. Ross Gilmour, 13. James Armstrong, 12. Zac Howard, 11. Euan Hamilton; 10. Johnny McCorkindale, 9. Harry Warr; 1. Ben Paterson, 2. Stuart Collier, 3. Ruairidh Sayce; 4. Adam Paxton, 5. Craig Brown; 6. Euan McLaren, 7. Seth Rae, 8. Cameron Reece. Adam Prentice, 17. Alan Miller, 18. Zander Howie, 19. Rory McMurray, 20. William Chan. Kick-off 2pm. Follow the match via the Ultimate Rugby app.